This is an example of an artefact which appears to be quite uninspiring. It’s not a shiny trinket or an exquisite handmade item. But it is evocative none-the-less, as it represents a living creature rather than a life-less object. It can also completely change our understanding of a site. Before the 1950’s it was often common practice to dump all animal bone excavated from archaeological sites, as it was thought little could be learnt from it. Now osteoarchaeologists and zooarchaeologists can decipher not only what species the bone represents, but often how old it was when it died, what killed it, whether it was eaten, even what ailments, injuries or diseases the individual harboured in life or around death. These bones form the jaw of a pig. 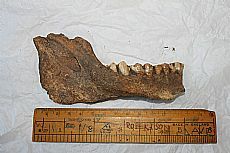 It looks quite similar to a human jaw but is longer and straighter and the front teeth slope forwards at an angle. This seems to be a young healthy pig with only slightly worn teeth. The fact that the jaw was found in pieces in a layer of other split and broken bones suggests that it was butchered. 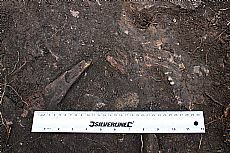 The amount of material, as well as a high concentration of charcoal suggests a lot of human activity, possibly feasting. Organic material like bone and charcoal can also be radio-carbon dated. This analysis has revealed to us that this pig died sometime between 47AD – 105AD. This is firmly in the Iron Age. This is particularly interesting not only as it showed the site to be much older than we had expected but also as the bone was so well preserved. It is unusual for bone to survive long in Scotland’s acidic soils, so the charcoal had modified conditions here enough to preserve it. This helps us state that the burning was significant and probably from a very large fire. The pig, or at least part of it, was almost certainly cooked and it may even be evidence of something much more mysteries and elaborate. As we know it died in the Iron Age we can look at parallels. One such parallel is High Pasture Cave (HPC) on Sky. Here many pig bones were found preserved in charcoal rich deposits. The pig bones at HPC also showed extraordinary butchery practice of being cut in two through their skulls and down their spines. 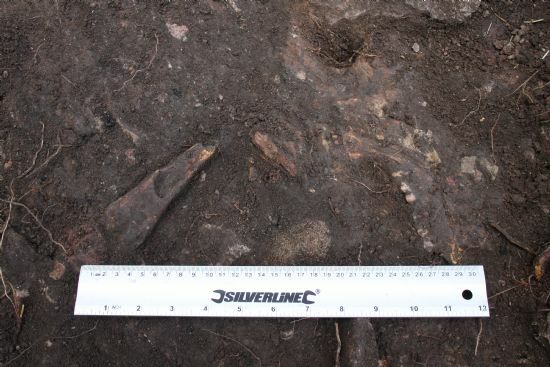 Although we did not find any split vertebra it is possible that something akin to the HPC activity was going on at our site all be it on a much smaller scale. So although this one find does not at first seem very exciting it has told us a huge amount about our site that would never have been known had it not been kept and analysed.